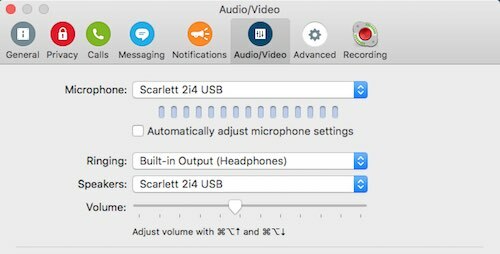 Using the Focusrite Scarlett 2i4 USB audio interface*, you can record Skype using several different methods to include a backup recording for redundancy. 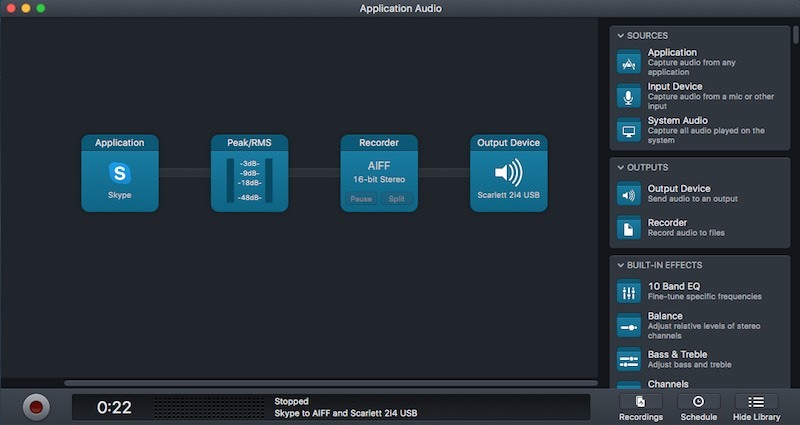 This tutorial is designed for someone who already has the Focusrite 2i4 and is looking for ways to use it to record Skype. That’s because, if you didn’t have any gear yet, my recommendation would likely be to use a mix-minus setup with a traditional mixing board. Or, perhaps I would suggest moving up to the Focusrite 6i6 so that you could use the included mixing software which would give you more flexible routing options like the kind you’d get from the appropriate mixer. The Mix Control software that comes with the 6i6 lets you create a real mix-minus. 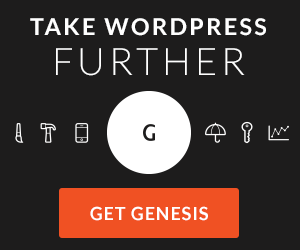 So if you already have a 2i4 there’s no need to buy any new gear. 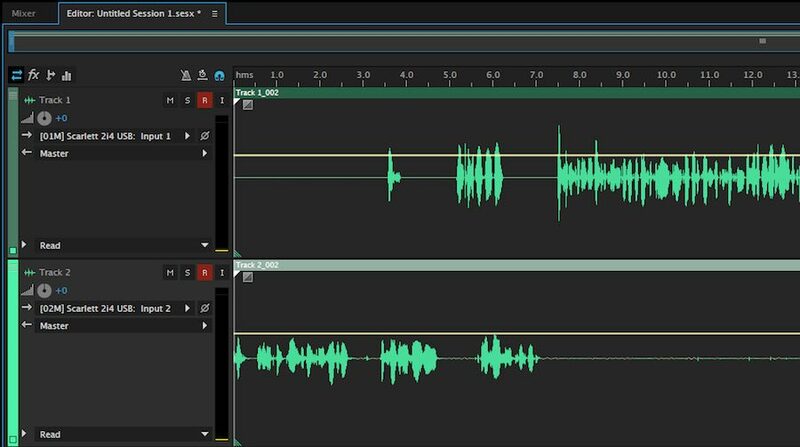 This tutorial will show you the various ways to use the 2i4 to record Skype either to Skype specific recording software, a DAW (audio editing software), and/or an audio recorder. 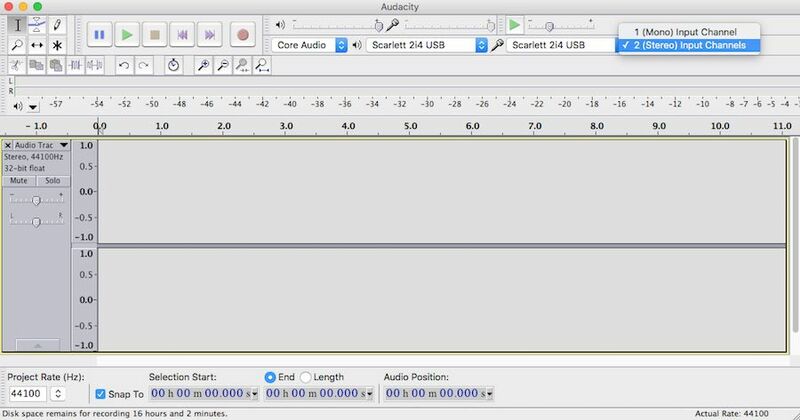 My preferred method amongst the following setups is to use a DAW like Audacity or Adobe Audition along with a digital audio recorder. This setup provides the most control over the audio in each recording and provides a backup system should the computer, DAW or recorder fail. 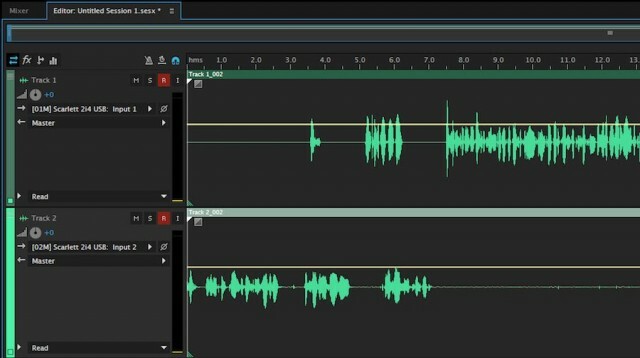 This tutorial only talks about using Skype because of the unique nature of how Skype handles its audio input. Skype only hears channel 1 or the left channel, mono. This is both a plus and a minus depending on the setup you are trying to use but in our case we’ll use it to our advantage to create a pseudo mix-minus. 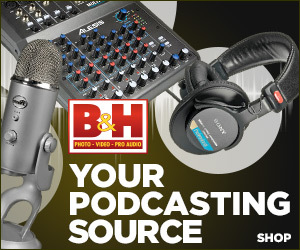 Because Skype doesn’t hear channel 2, we can use our computer’s output to bring our Skype guest back into channel 2 on the 2i4 and send both our microphone and the guest audio to both an audio recorder and audio editing software. If Skype took the audio from channel two as an input, the person on Skype would hear themselves receive a feedback loop of their own voice and our setup would not work. The downside to Skype only hearing channel one is that you cannot input two microphones into the 2i4 and have Skype hear the second microphone. Not without using some additional routing software. Here are the various setups I have used to record Skype using the 2i4, software and an audio recorder. Best Setups (1&2) – A DAW (Digital Audio Workstation) and Audio Recorder. 3.5mm stereo to 1/4″ TS cable to connect the headphone/line out of your computer (Skype’s output) to channel 2 on the 2i4. Output = any – don’t use Input Monitoring in Audition or else is the audio being recorded to Audition will feedback into your headphones and/or recording on the audio recorder. Select the “Inputs/Outputs” button shown below (two blue arrows going opposite directions) in the options above Track 1. In each track’s input section (arrow pointing right, seen in the image below) select the appropriate device. Notes: You can record multichannel audio into the audio recorder by switching to “Stereo” in the Direct Monitor section on the 2i4. 2i4’s USB cable to computer. Channels = 2 (Stere0) Input Channels. This will produce two channels on one stereo track. 2i4’s input 1 will get recorded to the left channel and input 2 on the right. 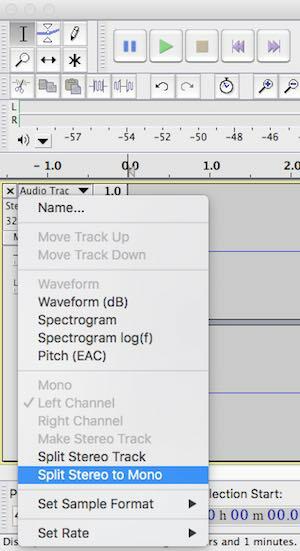 In post production use the toggle arrow on the recorded audio’s track and choose “Split Stereo to Mono” to break apart the channels into two separated tracks. You can record multichannel audio into the audio recorder by switching to “Stereo” in the Direct Monitor section on the 2i4. 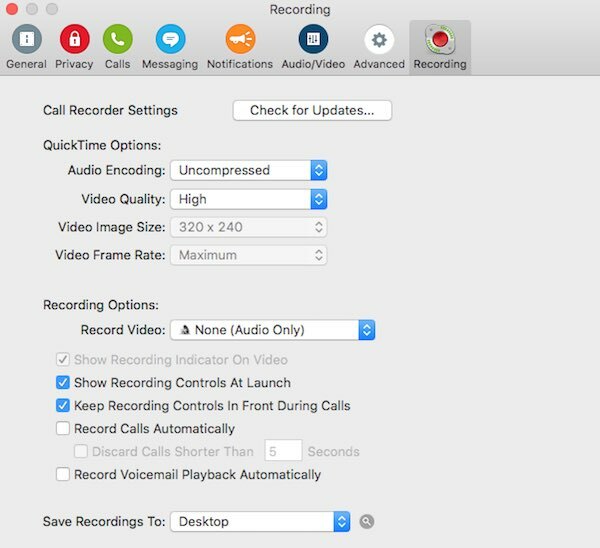 Second Best Setups (3&4) – Skype Recording Software and an Audio Recorder. Output = Any. It doesn’t matter because Audio Hijack takes over the audio (hijacks it) and all your output settings will be determine inside Audio Hijack. Basic Audio Hijack settings – Audio Hijack as a variety of setups which allow you to do things like use built in effects, multiple inputs, outputs, etc. 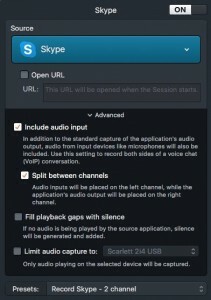 The settings here are the basics for recording Skype using Audio Hijack, you can add whatever else you need. Application = Skype. Click on the Skype block to view settings and toggle down the Advanced tab. 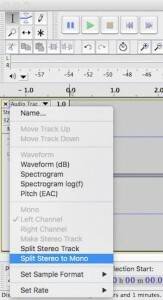 In the Advanced section, select “Include audio input” and “Split between channels” to include your microphone and send each channel to separate tracks (see image below). Meters = Peak/RMS is my preferred meter. When you click on it, you get a really nice large view where you can see, in fine detail, where your audio levels are peaking. This view can be left on while recording and even “pinned” to the top so that they are always seen in front of all other apps. Recorder = AIFF (uncompressed audio). Click the Recorder block to see advanced settings. I set mine to 16bit, Auto (44.1), Stereo (see image below). Call Recorder Settings – You’ll find these settings inside the Skype preferences panel. Call recorder will separate the channel automatically. To monitor yourself as well as the Skype caller, adjust the Input/Playback dial on the 2i4 so that you can hear both sources. Putting it at the 12 o’clock position works well. Audio levels being output to your recorder will be controlled using the large Monitor dial on the 2i4 as well as your recorder’s preamp. 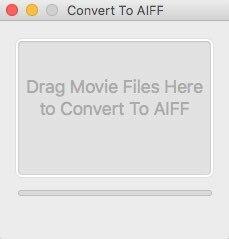 In post production, use Call Recorder’s included apps to break apart the .mov file into separate tracks and convert the files to uncompressed .AIFF. Unfortunately I do not currently have a computer running Windows to test other apps but it’s likely they are very similar. If you have a Windows machine, make sure your 2i4 has the latest firmware. To record Skype on Windows, you can still use the first setups shown in this tutorial. 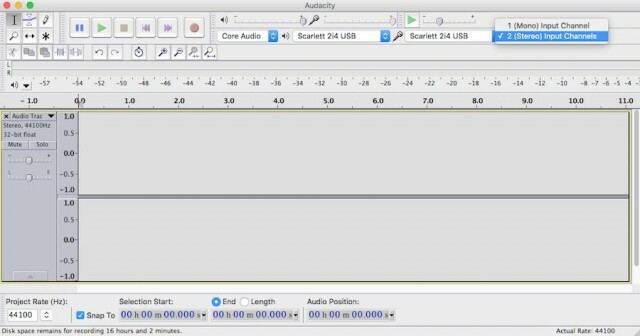 Both Audition and Audacity are also available for Windows based computers. For Skype recording apps, take a look at Pamela. If there are other apps that you prefer for Windows and you’ve tried them out with the 2i4, please let me know in the comments so that everyone can benefit from your experience. The other way to record is to use a Skype recording app (like those listed above) along with a DAW. This is a much trickier setup and because it’s my least favorite, I will simply list out some notes I took while trying to create this type of setup. Feel free to get in touch if you need more help. CR hears both channels of the interface even though Skype does not. To dual record with CR, you have to use the RCA or 1/4″ output of the 2i4 as the input for Audacity. In other words, use an RCA to 3.5mm stereo cable out of the 2i4 and then into your computer’s built-in input. Nothing goes into Channel 2 on the 2i4. Also 2i4 needs to have its Input/Playback dial set to 12 o’clock in order to hear yourself and Skype as well as have Skype go into Audacity. This is because the outputs on the 2i4 get their source from the Input/Playback dial and the volume is controlled by using the large Monitor dial on the 2i4. 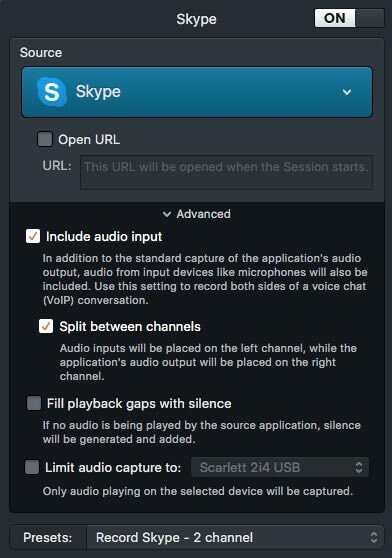 This works because Skype is sending audio out via 2i4 which means CR only hears ch1 (your mic) because it doesn’t have a ch2 input. Audio is coming from inside the device (2i4). That is why Audacity, using the built-in input can still get your mic and the Skype output. 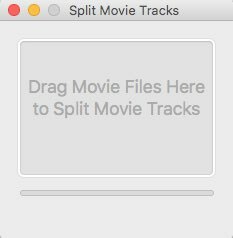 You can’t separate tracks in Audacity with this setup so you’d want this to be your backup. I hope this help somebody;) This started out as a simple test of a couple of these setups and turned into one of the more detailed tests I’ve ever had to conduct. It’s possible that something in this tutorial is wrong so please let me know if you get different results. 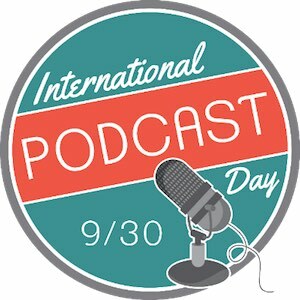 Please ask your questions in the comments or get in touch via twitter.com/podcasthelper.